Send a message. Cut him. Bench him. Trade him. Just get rid of him. Those were most of the reactions from Bills fans Saturday night, when the Bills announced that the veteran defensive tackle was sent home for violating team rules. The frustration with Dareus overshadowed the Bills 13-9 loss to the Ravens in the third preseason game. What did Dareus do this time? According to NFL Reporter Jason LaCanfora, Dareus was late getting to the stadium before Saturday’s game. This is not the first time Dareus has had trouble with team & NFL rules. He has overslept and missed practices, been in legal trouble in Alabama & Buffalo, and violated the league’s substance abuse policy. That has a lot of people demanding action. But Dareus’ contract makes any kind of action almost impossible. According to Spotrac.com, which tracks NFL salaries, the Bills would take a $38 million dollar salary cap him if they release him. $24 million this year, $14 million in 2018. That’s too big a number for any team to handle, no matter how much they are angry or frustrated with a player. Trade him? Not so easy. First you have to find a team that wants him and his baggage. Then you have to find out what they’ll offer for him. What would it take for the Bills to trade one of the most talented defensive tackles in the NFL? A third round pick? But even a trade presents salary cap issues. Even if a team was willing to take Dareus’ $9 million dollar base salaries for the next three years, the contract contains money and bonus payments that the Bills would still be responsible for. Trading him now leaves the Bills with almost $21 million in dead money, according to Spotrac. That includes bonus money that has already been paid, and remains on the Bills cap. Trading Dareus after this season still has a $14 million dollar hit. Financially, the Bills are handcuffed and have limited options. So Beane & McDermott will now be the latest Bills GM & coach who will try to get through to Dareus. When he’s right and available, Dareus is a top-flight talent. In the NFL, talent wins out. A great talent can get away with a lot of trouble. That’s just how it works in the league. 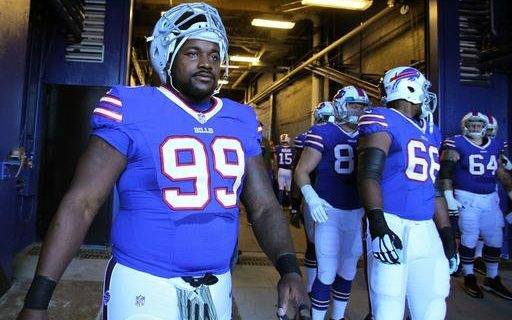 So get used to seeing #99 in a Bills uniform out on the field. Assuming he’s on time, not suspended, doesn’t pull a hamstring running out for player introductions and isn’t arrested.